Click on the above thumbnails to view the album. Kaylee and I were running errands on Saturday afternoon and on our way home I noticed a female duck pacing near a storm sewer in the road. I'd seen this before and since it had been raining earlier, I figured her babies must have gone down the drain. I pulled over and Kaylee confirmed the baby ducks were indeed, in the drain. Since we were on a fairly busy street, I decided to call the police and animal control to assist; I didn't want to cause problems on County Road 5 in Burnsville! As we waited for someone to show up, the mother duck unfortunately walked in front of a passing car and was killed. I'm sorry to say that at that point I gave up. However, Kaylee insisted she was going to save the babies. 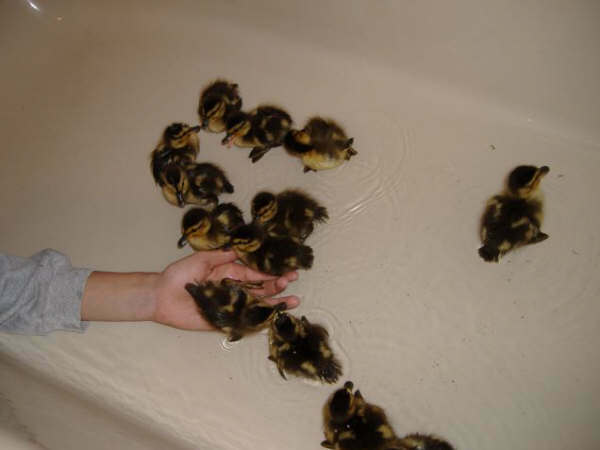 After the ducks came to our house, and swam in our tub, I called a friend who knew a man who raises mallards. The ducks were delivered to this gentleman where they will be raised with other duck babies about the same age and then returned to the wild when they are bigger and stronger. Thank you Kaylee for your big heart and respect for living things, and thank you too, to Rhonda for knowing who to call and finding a good home for the ducklings.